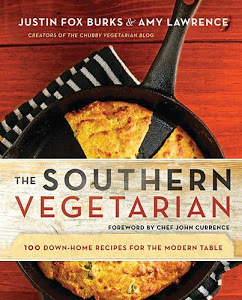 The Chubby Vegetarian: Our Southern Vegetarian Cookbook has arrived! Our cookbook is being released in May, and we're ready to celebrate! This really is exciting stuff. So many folks helped us get to this point, and we're so grateful for that. We can't wait to hear your responses once you have the book in your hands. Keep an eye here and on FB for news about upcoming events and book signings. And take a minute to comment below and tell us what ingredient, recipe, or meal is a favorite in your kitchen in order to be eligible to win one of the first cookbooks! We moderate comments, so we will post yours once we read it -- don't worry if it doesn't show up right away. Avocados! I hope I win! Our families favorite ingredient is garlic! I second the avocado. Followed closely by shrimp! Fresh herbs from my garden! Jumping right to the ice cream! Somehow, I have converted my Marine husband into a tofu fiend! Crispy tofu stir-fry with coconut sauce is our favorite preparation. Pesto, especially now that spring/summer is here and you can pretty much grow as much basil as you want. Mmmm, avocado! And also eggs. Om nom. The new favorite? Mint leaves from the front yard!! So pumped for this cookbook! I never thought I would get hubby to be veg at home. His other choice was starve. I told him he either had to cook his own food if he wanted meat or hire a cook to do that. So it's eat what I cook or else. I put garlic in just about everything. And then I hot sauce it up. Cumin is the most vital ingredient in my kitchen, I can't seem to get by without it. Congratulations on your book! I've been reading The Chubby Vegetarian for about a year and a half now and have to thank you for all the recipes. Pasta in all kinds of permutations! We have just renovated our kitchen so this book comes at a perfect time! Your recipes are great, I can't wait to dig in! Oops! I was so excited that I forgot to mention hot sauce is a staple in my kitchen. We have a dozen varieties from around the world and at least one makes it into every dish around here! Expresso Red Eye Gravy...Enough said! Chili! My husband being a vegetarian Indian I had to navigate my way around more spices than I could shake a stick at. I now can not live with out chili's. The hotter the better! Sorry I had to comment on the gravy. Awesome. As strange as it sounds Avocados and hot sauce are staples in this house. I am the only vegetarian out of five people and the only hot sauce enthusiast. Trying to get everyone else to eat what I eat is a task. Lately I've been using a ton of pickled jalapenos, but I love avocado. I also really enjoy the ancho chile tart you have here on the site. favorite: vegan macaroni & cheese. simple, but 100% comfort food! especially after a long day of work. Sweet potatoes.... and since we always have loads of eggs (from our backyard hens) definitely eggs! Congratulations on the book. Can't wait to read it. Our new favorite is quinoa. I go through fazes, but lately it has been Eggplant!! I can't get enough of it, stuffed, grilled, roasted, doesn't matter how it is prepared it is always delicious! My newest toy is a dehydrator, and chips are the current craze. First, when still in season, kale chips (your recipe! ), then leek chips with a Japanese spin, and lately, sweet potato chips with your Memphis spice rub, maple syrup and lime. Lately I've been using tons of paprika.....sweet, smoked, hot Hungarian. I can't seem to get enough of it. Burrata has become a new favorite in my house! Every southerner needs Sweet Tea to wash down all dishes, vegetarian or not! :) I make it with a few sprigs of frest mint from my garden to cut down the use of sugar. It used to be Frank's Red Hot, but I have switched over to Sriracha. Every recipe I have used Sriracha instead of Red Hot, my husband has said it has been the best time I've made it. lately I've been adding avocado to everything, but I also love the many forms of coconut! My favorite ingredient would be all varieties of potatoes. MEXICAN CORNBREAD with lots of jalapenos! I would be lost without lemons in my kitchen. They add so much flavor and brightness to everything! I currently can't live without wraps. I'm loving spinach-egg or asparagus-egg wraps for breakfast and various veggies wraps for lunch (like hummus and spinach or vegetarian baked beans and cheese). A loaf of good bread. We use it for toast, sandwiches, to scoop bruschetta, dip in or to thicken soups and stew, bake into bread puddings, make into croutons, etc. Necessary to life! Oh I would love this book! I've been scanning the shelves for something like it for a long time. Our favorite meal is a nice hearty vegetable lasagna. Mmmmm. Congratulations on your cookbook! So looking forward to it. Ya'll have the best recipes! Favorite dinner? Triple tomato soup + toasted white cheddar croutons; vegetarian meatloaf and garlic mashed potatoes; mascarpone banana pudding. Toasted sesame oil & sriracha! Ditto everyone who said avocados and hot sauce. I could truly make tacos every day and be happy. For breakfast on Sundays it's your Miracle Mushroom Gravy with Drop Biscuits - the best! Gotta love garlic hummus w/ pita! Beans are a staple. They can be cooked so many different ways. Congratulations on your new cookbook.. I love following your posts and seeing all the creative recipes, so I know I have to have this! My favorite thing lately is roasting veggies or squash in the oven. Brussels, cauliflower & asparagus taste so good roasted, I just eat them out of the oven. Roasted veggies - cauliflower, brussels & asparagus. Today I roasted acorn squash and stuffed it with quinoa and it was so yummy! Congrats on the new cookbook - I love all your recipes. HUGS! White faux sausage gravy. Even meat eaters can't tell the difference. Just as unhealthy and tasty as the real thing!! My favorite is tofu. The Siracha sauce is a close 2nd though! My favorite is tofu, though Siracha is a close second. It might be a tie! I cant wait! Quinoa is a new fav for experimenting. I've loved all the recipes I've tried. So glad THE cookbook is almost here! Hummus with pita chips...gotta love it! Mushrooms...I couldn't imagine being veg with out them. Vegetarian chicken pot pie and triple finger apple crisp! Your dirty fried rice + Mushroom Scallops and Creole Coconut Sauce is fab! you introduced ponzu sauce to our kitchen -- a big hit! My new favorite cookbook!!! Filled with so many great recipes! I received your cookbook a couple days ago and my husband and I can't wait to start making your recipes! Congratulations on a beautiful book! The vegetarian sloppy joe's are first on our list. Thanks so much, everyone! Keep us posted on what you make and what you like!